This Mocha Mousse Ice Cream is super smooth and delicious. 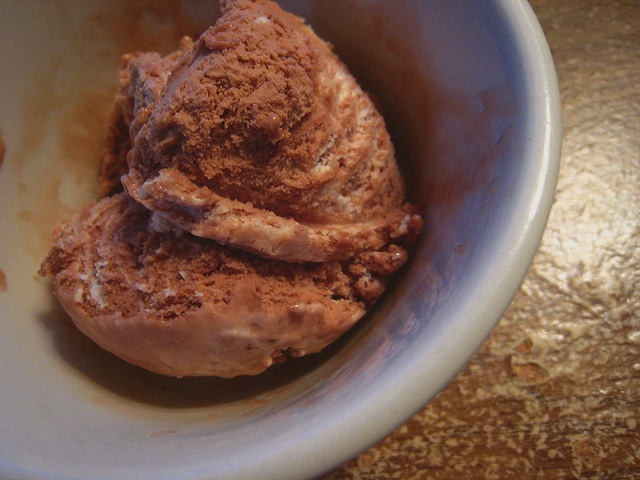 It was originally a recipe for chocolate mousse ice cream with a generous 3/4 C chocolate sauce, but added the instant coffee (mocha flavor) instead to intensify the flavor. To the heavy cream whipped with the salt, add the slightly beaten whole fresh egg and beat until well dissolve. Add, folding gently, but thoroughly, the chocolate and instant coffee. Pack freezer with additional ice and rock salt, and let stand 1 hour. Serve ice cream with cookies, if desired. : Add salt only after the cream has been whipped stiff.